Tu-2 (Tu Ying-Ming, or English: Ying-Ming Tu) is a visual fine artist who focuses on painting, photography, and documentary films. Born a Gemini - hence his self-given nickname, "Tu-2" (pronounced “Tutu” or "too too") - to a Hakka family in Taiwan, Tu-2 was infatuated with faces at a young age, influenced by the Taiwanese puppet shows. His father, an electrical engineer who managed a hydroelectric power plant, encouraged him to draw, so he did, whenever and wherever he could... until drawing became second nature to him. His father's untimely death plunged the family into crisis on all levels, turning Tu-2's life upside down throughout his early teens. Though shipwrecked, he survived on the sails of his innate intelligence, emotional sensitivity and awareness. Tu-2 gradually found his bearings (often through art), learned to nurture his soul-saving vulnerability, and began to build a steely resolve... a working mast of his character. He emerged a warrior, determined to strengthen his mind, heart, body and spirit. Tu-2 later made the first portrait of his father (right), during a near-death experience, not just to honor his memory or lessen the pain of his loss, but for Tu's own salvation. This portrait is significant for allowing the artist to experience the possibility of healing through art, and for awakening in him a timeless connection to the infinite through art. The idea that art can transcend life probably began for Tu-2 here. Personal discipline, hard work, and his natural physical competitiveness led him to master and teach martial arts, after which he was chosen to join the corps of personal bodyguards for Chiang Kai-Shek and his family. Tu later entered National Taiwan University and earned his BA degree with a major in history, while continuing to draw, photograph, and practice martial arts. He then worked as a photojournalist, traveling extensively along the Silk Road and other international locations; a documentary filmmaker; an art reviewer; and the founding director of the first Chinese-American television news unit in Taiwan. In the early 80's, Tu-2 came to the U.S. to study film and television at UCLA, where he earned his MFA degree, rounded out with lots of drawing classes. He became the news director of the major Chinese-American television station broadcasting from Los Angeles, Chicago, and eventually New York, after Tu was sent to establish that station on the east coast. Living in New York, Tu-2 moved into an East Village basement studio after his divorce. It was a cold, snowy winter in 1987... He got very ill and almost died. Since the creative act of drawing is so natural for him, what else would he do with his fading consciousness and last drop of strength? His explanation is typically simple: “...in order to survive death, I picked up a colored pencil and began to draw my dad's face. I felt much better after that, and decided to commit to becoming a serious painter.” From second nature to practiced skill, from hobby to therapy, then philosophy, belief, and eventually beyond, his talent crystallized through this near-death experience that awakened Tu to his lifetime vocation. He also made some fine documentary films in this decade -- his seminal documentary on the history, early days and subculture of "breaking" in Southern California, The Story of Breakdancing, is a well-observed, timeless charmer, and his groundbreaking Dialogue with Robert Heinecken, a poetic documentary, is both artistically and historically important, shown as part of museum exhibits in New York, Los Angeles, Chicago and Taipei from 1988 to 1991. But while hindsight (which often determines value in the saturated, finance-directed Los Angeles film scene) was just beginning to accumulate for his films, his paintings were already drumming up kudos in Europe and Asia. The chance to communicate and share his art with a receptive public sealed his dedication to fine art, and his lifelong fascination with faces drew him to portraiture, cinched by his natural curiosity and compassion. Throughout his life, whether in joyful times, or times of great anguish, suffering, hardship, and loss, making art has been Tu-2's silver thread of salvation. His iconic, monumental four-sectioned portrait of the Dalai Lama, an earlier work, fairly vibrates with emotions – electrically charged with compassion, radiant with love, hypnotic with serenity. The artist's painful journey from a tortured period to his hard-won, transcendent transformation is etched in every line, and all this seems to be communicated directly to the viewer's higher emotional center by some powerful magic... You feel it with all of you, all at once. 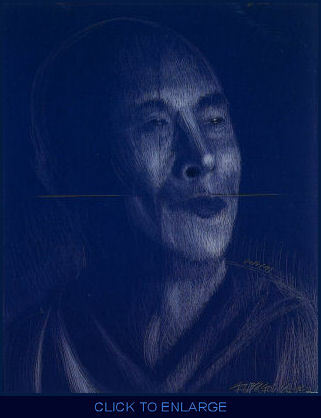 Infused with wisdom, compassion, humor and timelessness—like the Dalai Lama himself—the conscious art behind the "simple" silver lines illuminating the subject's inner qualities on a midnight sky-dark background is like a punch in the gut... it galvanizes you into the moment and changes your breathing. The heart beats differently, brainwaves shift, you feel as if you're vibrating at a higher frequency... awakened, on the verge... impassioned yet calm with subtly heightened awareness in an all-encompassing state of bliss-being. Only conscious art can have this effect, and it can only be made by an artist who is in a state of conscious enlightenment. ...Only true art can feed your soul! Tu-2's Timeless	series is deeply personal, iconic yet intimate, impressively crafted with a brilliant, original array of techniques. 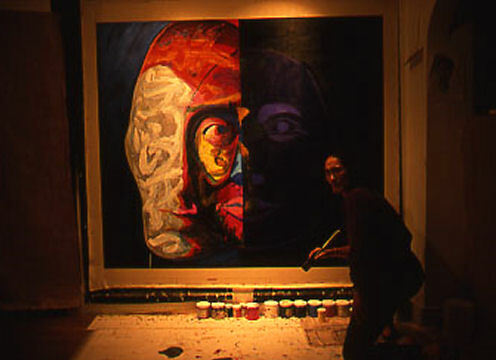 Representing his unique identity with such honesty has sparked intellectual analyses of his work regarding "'Doubling Identity' in the Chinese Diaspora" (one literary scholar's essay is published in the book about the artist's Timeless series exhibitions, Tu-2 Timeless) and other scholarly musings on truth and and identity in a global age; The large paintings are beautiful, powerful and... timeless! His Mickey Mao series Mao-ology (Mao-ology from 0 to 2) is a tour de force of bold revolutionary art and has been exhibited in Belgium, Los Angeles and Taipei. 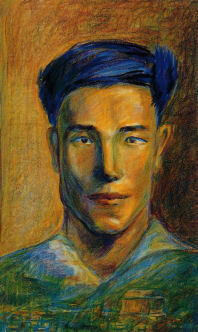 Mickey Mao made the cover of Asian Art News magazine, an influential English-language magazine, established and sold in the US and Asia for over two decades. His work in both series was highly acclaimed by critics and public alike, and is the sole subject of two books and explored in more than a score of publications and interviews in Europe, Asia and the US. Tu-2 was then invited to represent the artists of his country at the 100th anniversary of the Venice Biennial (Biennale di Venezia), which he did with gratitude. A little over a decade ago, after a period of robust success with his first two series, Tu took a prolonged sabbatical from painting to search his soul, reset his spiritual compass, and examine his increasing calling toward monkhood. A new body of work emerged: a series of spiritual portraits in silver pencil on blue paper that reveal the interior qualities of their subjects, who cover a global range of occupations, ages, races, and interests. Depicted in chiaroscuro (a light-dark technique with ancient roots)—but using a silver pencil to draw only the light— the images seem to be floating from darkness to light, mostly in a state of serenity. Creating these portraits is an act of meditation for Tu-2, as he works exclusively in a focused meditative state—connecting to the subject’s essence, free of ego. The resulting works of conscious art inspire awakening, affinity and compassion. He named this new series "108" (Portraits of Compassion), as in many eastern religions (including Zen Buddhism) the number 108 symbolizes the infinite, or “infinity.” This number is a concept, not a limitation, so the actual number of portraits is ongoing, toward infinity.... Although a representative collection of 108 of them would rarely be shown at once, due to the usual constraints of space and logistics, they are ideally viewed as a group, to illustrate the infinite ways in which humanity is connected through time and space. An artist in mid-career, Tu-2 recently completed his year-long residency as artist-in-residence at the O Street Museum Foundation in Washington, D.C., for the year of 2012, and is continuing work on his latest oeuvre, the Blue Series, "108" (Portraits of Compassion) in his intriguing art studio. The existing "108" Blue Series portraits are not for sale, but privately commissioned portraits may be ordered, in various media, depending on the artist's prior commitments. Copyright 2011 © Ying Ming Tu, Tu-2 / A.Tripp - All rights reserved worldwide.